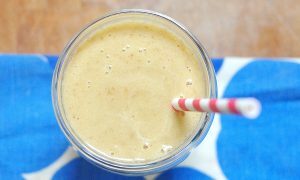 This recipe, and others like it have been real lifesavers for me over the last few months. The basic idea is to take a cooked grain (and you can use barley, quinoa or brown rice in place of farrow here—whatever you have around and enjoy) and sauté with vegetables or meat or beans and other flavors. 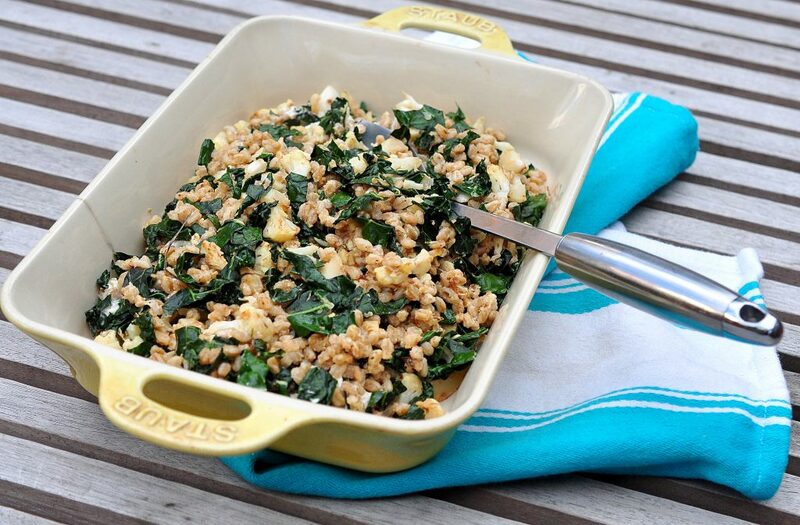 This one is made with farro (a delicious, chewy, springy whole grain from Italy that is pretty easy to track down these days), sautéed cauliflower, kale, garlic and lemon, topped off with goat cheese that melts and adds creaminess and tanginess to the whole dish. Pregnancy has not been an easy experience for me. I am so grateful for it, and can’t wait to have our daughter, but being pregnant is not something I will look back on fondly. I have had a lot of sickness (including a stay in a Greek hospital while on vacation) and pain and general exhaustion. At times it’s been tough to do my job since being creative about food is the last thing you want to do when you are severely nauseous. Recipes like this are so helpful because I can make them to my taste based on which foods smell good and which are making me nauseous. 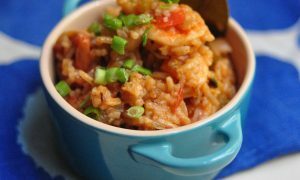 They are simple, healthy, flavorful and satisfying, and you can make a big batch of them and eat them for a few meals. This is key because when you are too tired to move or starting to feel sick and hungry you can pull this out of the fridge and warm it up and know you’ll be okay in a few minutes. It’s a huge relief. My husband, Dan, who doesn’t normally find this kind of healthy bowl food all that exciting, really enjoys this one and even went for seconds. Hope you guys like it too! A note about buying farro: there’s a lot of confusion around farro since there are several types, the most common are semi-pearled, pearled and whole grain and they not always labeled properly or with anything besides “Farro” in North American supermarkets. Most of what is available in packages, for example, the Bob’s Red Mill farro (always a good source for more unusual grains) is semi-pearled. This means some of the bran has been removed so it takes less time to cook, but some of the bran is still intact. 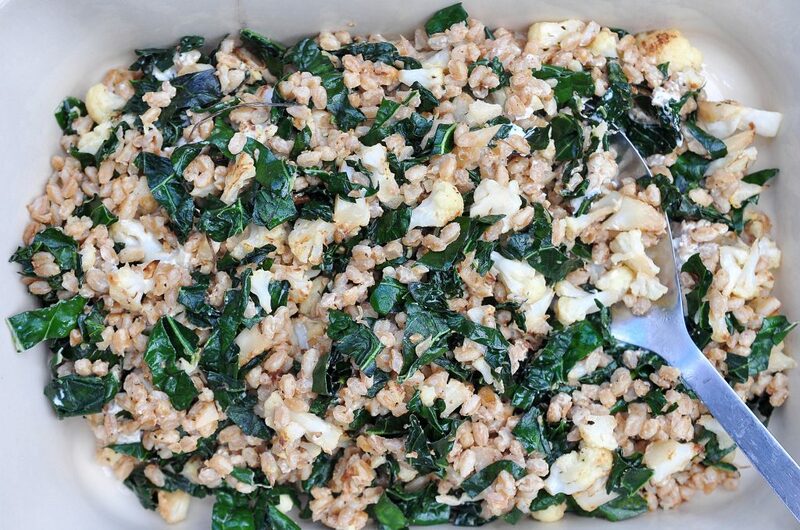 For this recipe I am using semi-pearled farro. If your farro is unmarked you can check to see if it is semi-pearled by looking at the cooking instructions on the package. If it claims to cook in 30 minutes then it is semi-pearled. If longer or shorter you may have one of the other varieties. 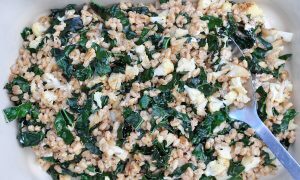 A warm salad bowl made of cooked farro, browned cauliflower, wilted kale and flavored with garlic, goat cheese and lemon. Rinse the farro in a sieve in the sink. In a medium-size pot bring the farro, water and salt to a boil on medium heat. 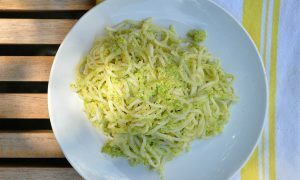 While the farro cooks, chop your vegetables and get everything ready so you can make the salad quickly once the farro is ready. Once the farro is boiling, turn the heat down to low and place a lid on just slightly askew so some steam can escape. Cook for approximately 30 minutes. Check after 25 minutes and add a bit more water if the pot looks too dry. Once 30 minutes has passed, taste one of the farro grains and see if it is soft enough to eat but still with a little chew, kind of like good pasta is cooked al dente. 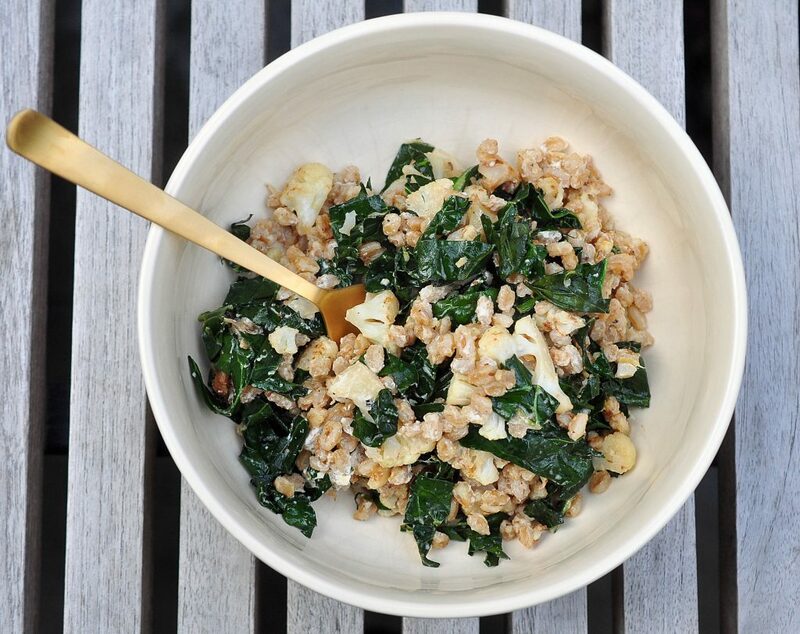 If it’s cooked enough, take the farro from the heat and drain any excess water. Add one Tbsp of butter to the top and let it melt and mix in. Put a lid on the pot so it stays warm while you continue with the rest of the meal. In a pan on medium heat, melt the rest of the butter. Add the garlic and cook for about 30 seconds, just until the garlic smells good. Turn up the heat to medium high and add the cauliflower and cook, stirring occasionally, for about 6 minutes. Let it get a little brown, with some crunchy bits. Next add the farro, and toss. Cook for 2 minutes more just until the farro is warmed up. Add a bit of salt and taste to see if the cauliflower is soft enough for your taste. Add kale and the zest of the lemon. Stir to wilt the kale, it shouldn't take more than a minute. Add a bit more salt and taste, if it’s a bit under-salted that is okay because you’ll get more saltiness from the goat cheese in a moment. If it tastes good, turn off the heat and add the goat cheese and a generous squeeze of lemon juice. 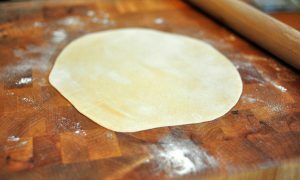 Taste one more time and add more salt, lemon or goat cheese if you think it needs it. Serve warm.